Today, content plays an important role in all major forms of traffic generation and digital marketing. Convincing cold (and even warm) prospects to visit your website is difficult without first leading with valuable content. The processes you develop to distribute content, and thus generate traffic to it, are as important as the processes surrounding the creation of that content. Email is still the best method for making offers and sending more content, so growing and maintaining your email lists are critical tasks, which is why growing your email list is built into your content strategy. After you’ve produced a content asset, such as a blog post or a podcast episode, use your email list(s) to drive traffic to that piece. Next, open your email with a short, punchy introduction that pulls people into the main body of your email, where you pique the email subscriber’s interest and describe what he can expect from the content. Explain this email’s relevance to the reader and what he has to gain from it (also known as the benefit). Also, be sure to include a call to action that instructs the subscriber to click the hyperlink to your content. Use two to three hyperlinked calls to action to make clicking them as convenient as possible. Search engines, such as Google and Bing, are important content distribution channels to leverage. When prospects reach your site by querying a search engine (they might be searching for “dslr camera reviews” or “crepe recipes” in Google or Bing) but haven’t selected an ad, they are using search marketing. The traffic driven to that content wasn’t paid for but was found naturally by the users. Today, search marketing is simple. The search engines, particularly Google, have become adept at sending traffic to the content that is most likely to satisfy the intent of the searcher. If you are committed to creating content assets that satisfy the intent of your various customer avatars, you’ll get plenty of love from Google and other search engines. After you have created a piece of content, use the social media platform(s) that your business participates in to drive traffic to that content. Be aware that driving traffic on social media may take several forms, such as a tweet on Twitter or an update on Facebook or LinkedIn. This update announces the new content and provides a hyperlink to it. When you write text for a social media update, your brand’s personality should determine how you announce this new content. For instance, if your brand is a refined jewelry store, you may want to use a formal tone in your copy. The length of the copy depends on restrictions (such as on Twitter) and the complexity of the offer. Simple offers don’t require the same amount of description as complex offers do. Regardless of the length of the copy, be sure that the social media update piques the viewer’s curiosity, describes the benefit of the content, and has a clear call to action, such as this home improvement store Lowe’s Facebook post. This social media update meets all three of these requirements effectively. 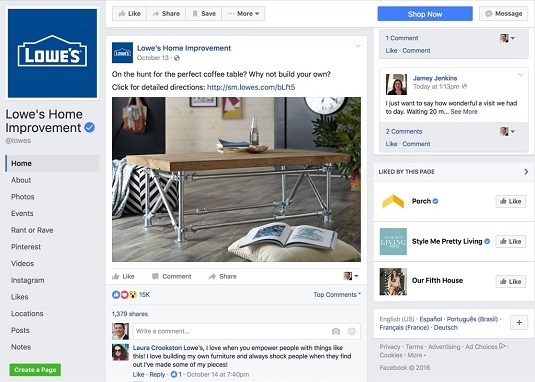 On Facebook, Lowe’s establishes the benefit of the content and gives a clear call to action for the viewer to click. As the name suggests, paid traffic takes the form of ads that promote your content and helps your content gain reach, or exposure. You can display ads on many different platforms, including search engines and social media. Paid traffic can be highly effective at generating leads because it helps you to segment your visitors and make use of retargeting. When a prospect visits a piece of content, she places herself into a particular segment of your potential buyers. She’s indicating an interest in the offer, topic, problem, or solution found on that page, and you can take advantage of ad retargeting networks such as Google and Facebook to show ads to this prospect based on the content she has visited. Although many marketers may be reluctant to pay to send traffic to content, such as blog posts and podcasts, paid traffic has a major advantage: It’s predictable. When you cut a check to Facebook, for example, to promote a piece of content, you will get traffic. This is why, at all times but especially when buying ads for your content, you must ensure the exceptional quality of your content. The last thing you want to do is spend money to send traffic to poor-quality content. Use paid traffic to promote quality content that gives value to the consumer and aligns with your business goals. This will help you move people from one part of the funnel to the next, progressing from ice-cold prospect to a lead to customer to repeat customer and, ideally, to raving fan.